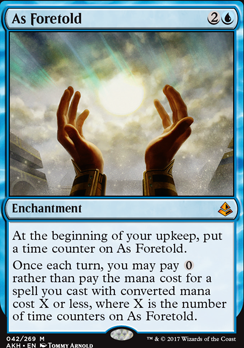 If I pay buyback on a card cast with card:As Foretold, does it cost 0? Does card:Fist of Suns change the mana cost of spells? At the beginning of your upkeep, put a time counter on As Fortold. Once each turn, you may pay rather than pay the mana cost for a spell you cast with converted mana cost X or less, where X is the number of time counters on As Fortold. Ok so here's a quick breakdown. Cards like Restore Balance , Ancestral Vision , and even Evermind cannot be cast normally. Electrodominance and other things like As Foretold circumvent this. Reasons: these cards do not have a mana cost, meaning you cannot just straight up cast them from your hand because unless otherwise specified, paying a cost is part of casting a spell. However, these cards have a converted mana cost of 0, much like Ornithopter or Memnite . When a card looks for the CMC of a spell, it sees these as being 0 which allows this interaction to work since it lets you cast them without paying their mana cost. 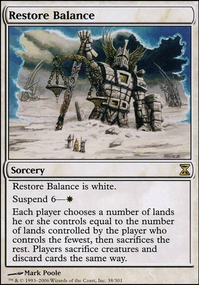 Another thing to think about it the reminder text for Suspend, which is how these cards were originally meant to be cast: Rather than cast this card from your hand, pay White and exile it with six time counters on it. At the beginning of your upkeep, remove a time counter. When the last is removed, cast it without paying its mana cost. It functions the same way in allowing you to circumvent the non-existent mana cost. I hope this helped, and I can go into further detail if necessary. While more than a simple mechanic, Experience Counters commanders in allied colors in a new precon would be nice, even though these wouldn't be forgotten mechanics. I'd like to see some more Tribal Spells that take advantage from actually being played in their tribal, awarding us with some bonus effect, whipe still being playable without the tribe, but without bonus. 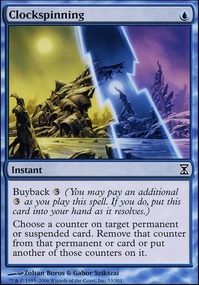 I'd like the comeback of my favourite mechanic, Suspend, as seen on Jhoira of the Ghitu . If not that, more cards that work with time counters, as we've seen with As Foretold , that can combo off with much older cards like Timecrafting . Klazen: As Foretold is now on my radar for sure. While it does take some time to get going, this represents an interactive instant with, say, just 2 counters, during other players turns, let alone casting free things with more counters. 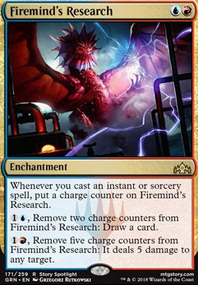 This is probably among the best 3-CMC mana sources for this kind of strategy and might actually be better than Astral Cornucopia. Give / Take is another card I have looked at but am not totally sold on. Take is the obviously exciting side, which would be used with Toothy most of the time, triggering Toothy with the draws to replace all the counters almost immediately. However, Give (or fusing Give with Take) is a little underwhelming for three extra mana, however, as there are better spells for distributing counters. Crucially, the effect of Take on Toothy can be replicated (for instance with Repudiate / Replicate itself) simply by cloning Toothy. If this were another Simic +1/+1 counters deck, I could justify including Give / Take, but this particular interaction between Toothy and clones means that I would rather have the flexibility of a clone instead of a narrower card such as this. TheNocholas: Yes! War of the Spark (with proliferate and loyalty counters abound) could be even better for this particular deck than Ravnica Allegiance was. 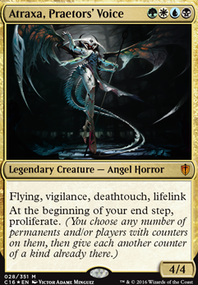 Already I want to play with Merfolk Skydiver , Neoform , Karn's Bastion , and the Landfall -- Proliferate elf, and some other cards, including the planeswalkers, are good candidates as well. Looking forward to seeing what else is announced for this set. channelfireball12345: I do notice this card whenever I am looking for a cut. Bond Beetle is a good suggestion, and as I was looking into getting one, WAR is already providing a strictly better Ironshell in "Pollenbright Druid" (and the even spicier Merfolk Skydiver at the same CMC). 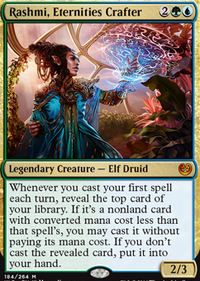 Another alternative is Elvish Visionary or the new Fblthp, the Lost if I'm finding the main purpose of the beetle is to put the counter on Toothy. The reason I included this card is because Ironshell Beetle's original printing was in the first magic deck I ever owned, given to me as a gift, and I happened to collect the card in this deck at a GRN draft. The beetle will definitely be cut for something from WAR once it drops. This is a very cool deck, you've built. I built out a Pir and Toothy deck as a per-cursor deck to my deck, Mad Science. You've got a lot of the same cards and abuses of counter creation built in ( Astral Cornucopia + Power Conduit types of things), and I love it! One thing I actually didn't think to do was put in level up creatures, but that's a nice touch! Out of curiosity, did you ever consider As Foretold ? I'm curious what you think about that card in a deck like yours. I get that you don't have too many huge mana cost spells, but a free one each turn would be nice if you're drawing tons of cards with Toothy. Another card I really love for your deck is Give / Take , and I don't even hesitate to suggest that one, like I do with As Foretold. If you can cast both halves of it, it gives you the ability to draw cards off of Toothy without his needing to die, and then to power him back up again to a 5/5 (if Pir is also on the board). Alternatively, you can power Toothy up even higher with the 'Give' half, and then remove the counters to draw even more cards. If you can't cast both halves of it, it's still a nice card for early-mid game, and you choose which effect is most useful. It's a fantastic card with those two commanders as it has synergy with either/both of them.